The past comes back to ultimately haunt Tekashi69. Over the course of his career, the past has come back to haunt Tekashi69 on numerous occasions. There is always a cloud looming over him, reminding fans of his questionable criminal history involving alleged sexual acts with a minor. 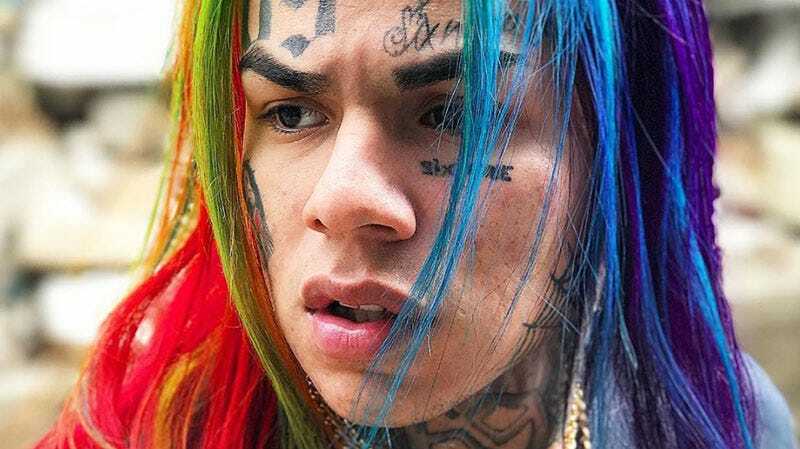 While the self-proclaimed King of New York has been running his city for the majority of the year, 6ix9ine has also been a target for dozens of rappers and rival gang members along the way. Back in January, a 16-year-old fan claimed that he was attacked and choked by the Brooklyn rapper at a shopping mall in Texas. Well, now the incident is coming back to bite him in the you-know-what as he was reportedly arrested on a warrant moments ago. After stating that he was returning to his throne in an Instagram post yesterday, the rainbow sensation was nabbed by NYPD at JFK airport as he was arrested on an outstanding warrant for choking the teen. TMZ broke the news, revealing that the rapper’s team had intended to deal with the situation soon, as they were previously made aware of the warrant. In what is ultimately a misdemeanor case, the publication is reporting that 6ix9ine’s team is perturbed about him being extradited to Texas directly following his return from a successful European tour. There are limited details at the moment and it’s unclear if Tekashi is being held at the station or not. We’ll keep you posted as info comes in.